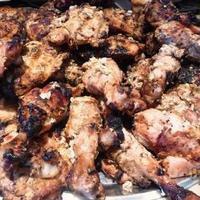 This recipe, known as Murgh in India, is amazingly flavorful and a real crowd pleaser. I served two BBQ chicken recipes for July 4th, my father-in-law's Chinese Barbecued Chicken (linked below) and this new dish. The kids mostly ate the sweeter Chinese version, but the adults split about 50-50 in terms of their favorites. I saw many going back for their 3rd or 4th piece of the Afghan chicken. It's that good! I adapted this from a recipe by Steven Raichlen, who in turn got it from Karim's restaurant in New Delhi. Place yogurt in a yogurt strainer, or put a colander over a large bowl, and line the bowl with cheese cloth. Let drain in refrigerator for 4-6 hours. About a cup or more of liquid will be removed to make the yogurt much thicker (which will help it stick to the chicken). While yogurt is straining, Add the garlic, ginger, onion, lemon juice, cayenne, salt, paprika, black pepper, and toasted cumin seeds into a large bowl. Dump the strained yogurt into the bowl and remove the cheese cloth. Mix the yogurt and the other contents of the bowl together with a large fork until well mixed. Remove the skin from the chicken pieces, rinse, and pat dry. Make 2-3 cuts, bone deep, in each piece of chicken to help absorb the marinade. Put each piece in the marinade and cover thoroughly, then put in a large ziplock bag. Refrigerate for 4-6 hours. Preheat grill to high. Oil the grate. Add the chicken pieces and grill, turning with tongs until they are nicely browned on the outside but not burned, about 8-10 minutes per side. If your grill is too hot on high to do this without burning, use medium high or whatever setting you feel will achieve the desired result. If you have additional marinade, you can brush additional marinade on whichever side is turned up when about 5 minutes of grilling are remaining. The sauce is wonderful, so I recommend this. Transfer to a serving plate and serve. A garnish of onion, tomato, cucumber, radish, fresh beet slices, and lemon wedges is traditional but optional. I also served with basmati rice, but fresh flat-bread or Nan would be wonderful too! This chicken was truly amazing! There was another chicken available, Asian-style semi-sweet one, and I liked this one more (though the other one was also great). The amount of spices was just right, not too spicy, not too mild. Thanks for the great recipe, John! Great dish, John. That's a brand new marinate for me. Very tasty! Thanks for that. This chicken was really fantastic. I had a cold piece the day after for lunch, and it just keeps getting better! This sounds wonderful... and I have a new grill! This looks good. I haven't tried making Afghan recipes, and this could be my first to try. Can't wait to try this John, I love exotic flavor so it sounds like my palate will approve! You'll love it, Karen. I can almost guarantee that! Thanks. Hope you enjoy it Deepti! It looks delicious. I have eaten @ Karim's and they have the best meat dishes there. This recipe sounds a little similar to Tandoori Chicken I make. Just that I don't toast my cumin seeds and I add red color to my tandoori chicken. Also there are no onions. Your adaptation is a must try and a great barbecue recipe. Thanks for sharing. Thanks for the comment, Pree. I hope you'll share your Tandoori recipe someday!